As a chamber musician he has played with Paul Tortelier, Vadim Repin, Gidon Kremer, Natacha Gutmann, Pinchas Zukerman, Yuri Bashmet, Mstislav Rostropovich, Pierre Amoyal, Michel Dalberto, Alisa Weilerstein, Renaud Capuçon and many others, in Europe, Canada, the United States, and Israel. 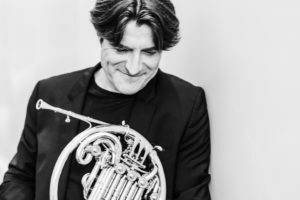 He was named principal horn of the Philharmonic Orchestra of Radio France (Marek Janowski) at the age of 20, and then with the National Orchestra of France (Charles Dutoit, Kurt Masur, Daniele Gatti, Emmanuel Krivine). He has also performed with the orchestras of New York, Berlin, Amsterdam, Rome, Milan, Cologne, Brussels, Oslo, Stockholm, Munich, Boston, Seoul, also with the Mahler Chamber Orchestra and Chamber Orchestra of Europe, conducted by Seiji Ozawa, Riccardo Muti, Bernard Haitink, Leonard Bernstein, Zubin Mehta, Daniel Barenboim, Pierre Boulez, Claudio Abbado, Lorin Maazel, Gustavo Dudamel, Daniel Harding, Yannick Nézet-Séguin, Neeme Järvi. Joulain has given masterclasses in many French cities, as well as in 22 countries like Portugal, the Czech Republic, Canada, Brazil, Ireland, Spain, England, Finland, Italy, Switzerland, Luxemburg, Malaysia, Holland, Korea, Germany and Japan.